The ancient town of Luang Prabang in Northern Laos is without a doubt one of the most beautiful spots in South East Asia. Abundant in natural beauty, Luang Prabang sits at the confluence of the Nam Khan and Mekong Rivers and is surrounded by lush green hills. 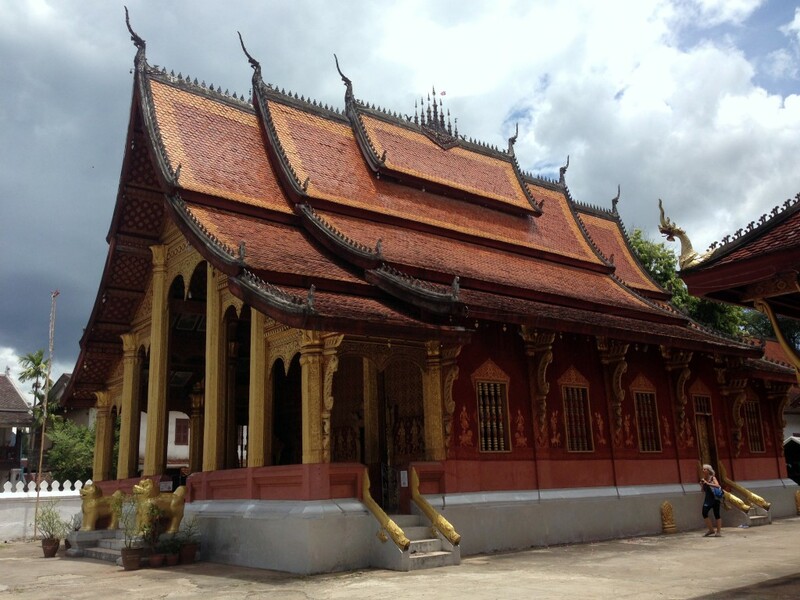 Also cementing Luang Prabang’s title as the premier tourist destination in Laos is its blend of French colonial architecture and timeless Laotian temples. In 1995 Luang Prabang was designated as a World Unesco Heritage Site. Luang Prabang is also the foodie capital of Laos, and I had a fabulous time trying some of its delightful food offerings and restaurants. 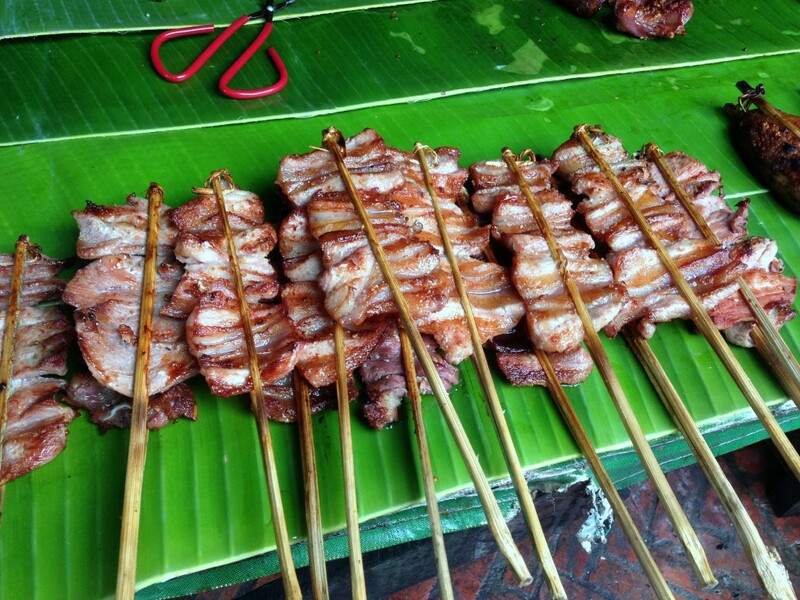 I was in Luang Prabang for only four days, but the TheLondonFoodie spent almost two weeks there. He has written two excellent and extensive blog posts on his food experiences in Luang Prabang, so I highly recommend that you read these should you intend to visit Luang Prabang (post one and post two). 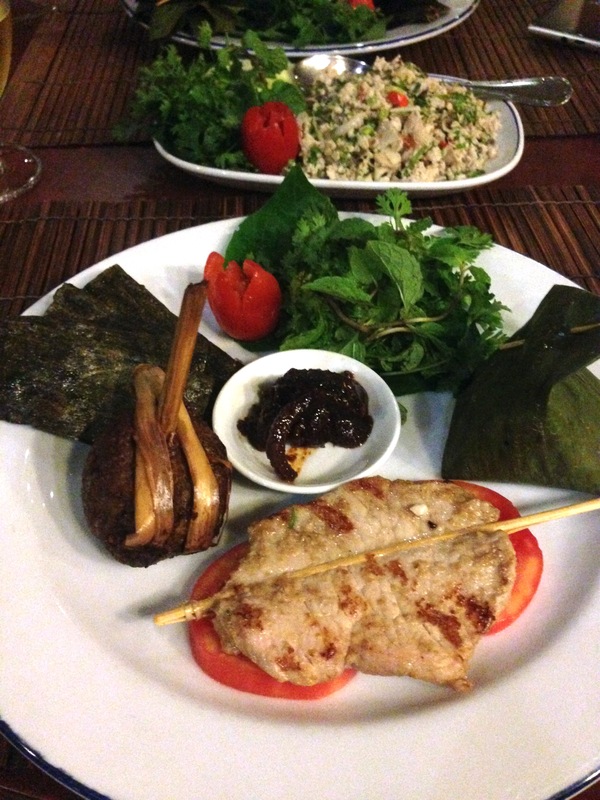 But I’d also like to share with you my top eat experiences in Luang Prabang, beginning with L’Elephant Restaurant. This is often cited as one of the best restaurants in Luang Prabang and I would concur as L’Elephant Restaurant proved to be my best meals in Luang Prabang. 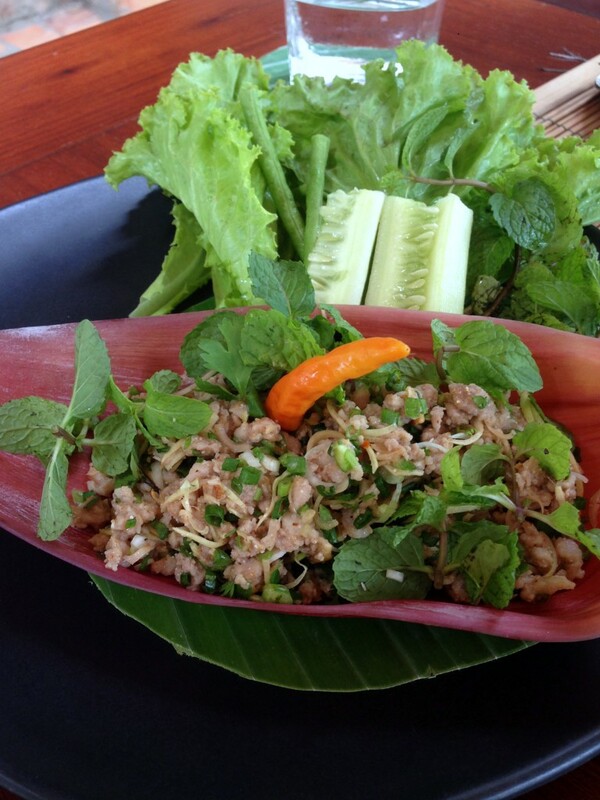 L’Elephant is part of a group of restaurants in Luang Prabang owned by a French and Laotian pair. L’Elephant serves both French and Laotian cuisine, and we decided upon the Laotian set menu, the “Saveurs du Laos” (145,000 KIP – £11) which we loved. 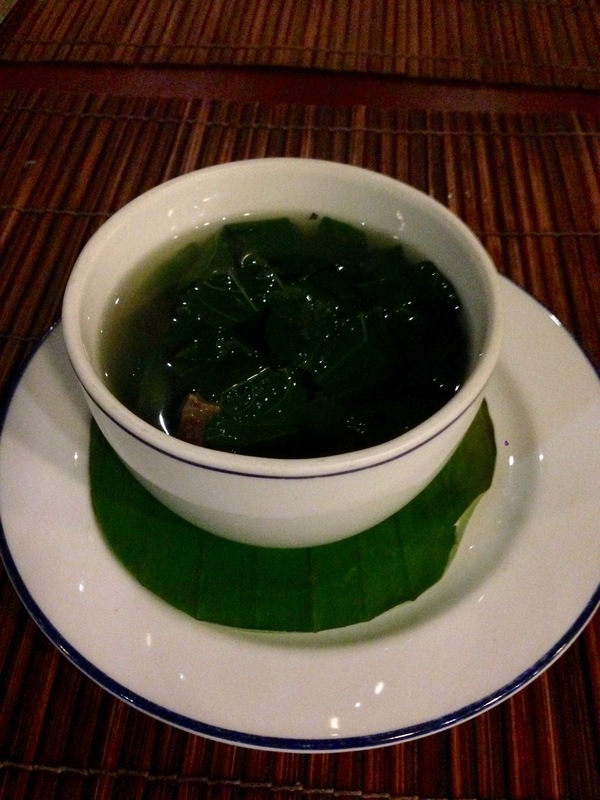 The menu began with an exquisite clear soup of tender delicious beef with betel leaves, galangal and lemongrass. The soup was wonderfully tasty with a clean, fresh and fragrant flavour. This was followed by a main plate consisting of a number of different dishes, all of which were delicious. Particularly delightful was the Mekong fish with lemongrass, rice powder and kaffir lime. 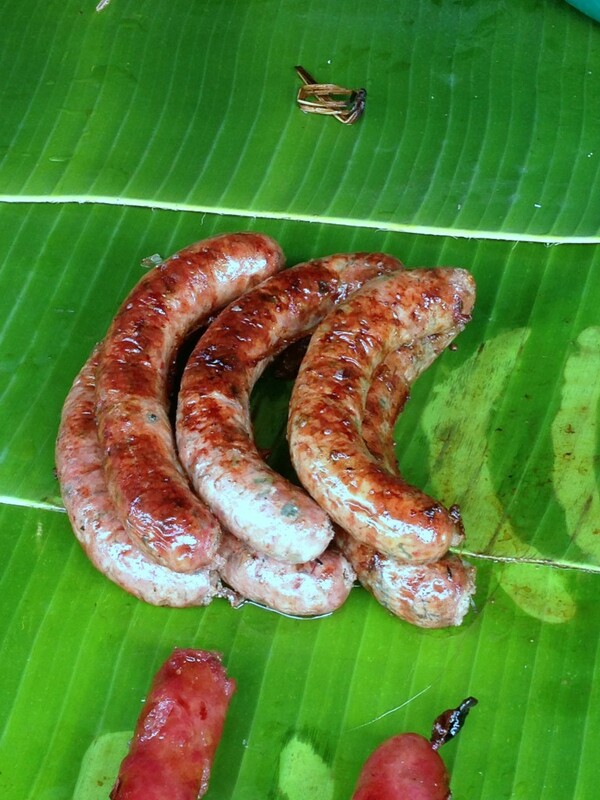 This had been steamed in a banana leaf papillote and was delightfully fragrant and moist. Also on the plate was a tender and tasty piece of grilled pork marinated in lemongrass, a wonderful steamed piece of pork on a lemongrass stalk and a local specialty of crispy Luang Prabang weeds with sesame seeds. Accompanying the main plate was some sticky rice, a fabulous chicken laap (salad) with coriander, spring onions, mint and chilli that was fresh and full of flavour, and some delicious sauteed vegetables with mushrooms. The dessert was a fruit salad topped with a delightful ginger ice cream. I thought the food at L’Elephant was excellent. It was fresh and refined with wonderful authentic flavours. The cooking was very strong technically and I would thoroughly recommend it as the one must try restaurant in Luang Prabang. 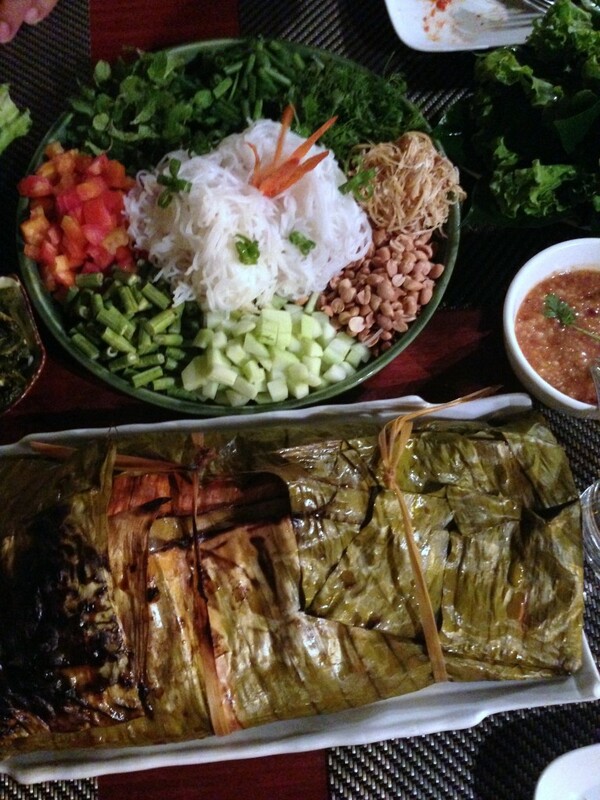 Tamarind is both a restaurant and a very known Laotian cookery school. I didn’t have the opportunity to do any of the cookery courses as you need to book these in advance. 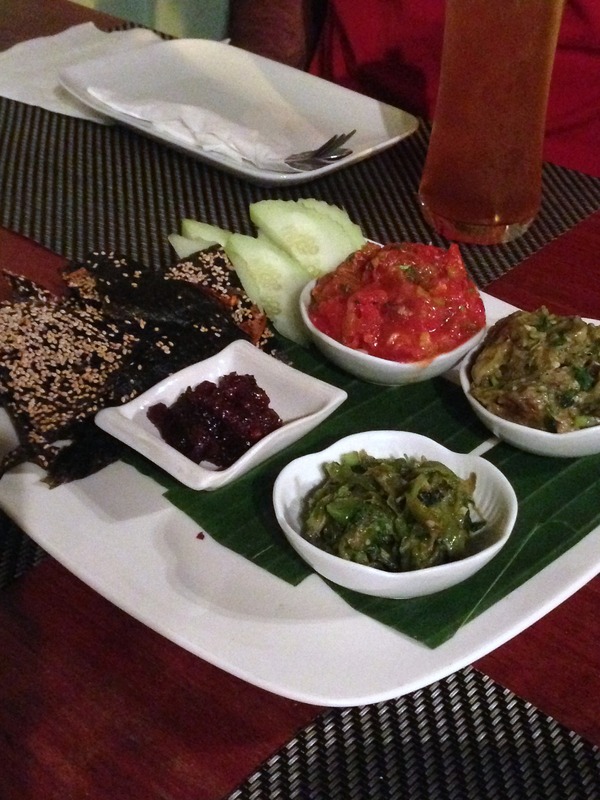 However we tried the Pun Pa (110,000 Kip – £8.50) on Friday night, a colourful evening which began with a tasting platter of Tamarind’s delicious savoury Laotion dips (jeow) including tomato, smoky eggplant, buffalo skin with peppers as well as a chilli paste. These were served with Mekong weed with sesame. The dips were followed by a whole tilapia marinated with herbs and lemongrass, wrapped in banana leaves and then barbequed over charcoal. The fish was perfectly cooked and very moist. The fish was eaten wrapped in leaves with a selection of noodles, vegetables, herbs and savoury sauces. 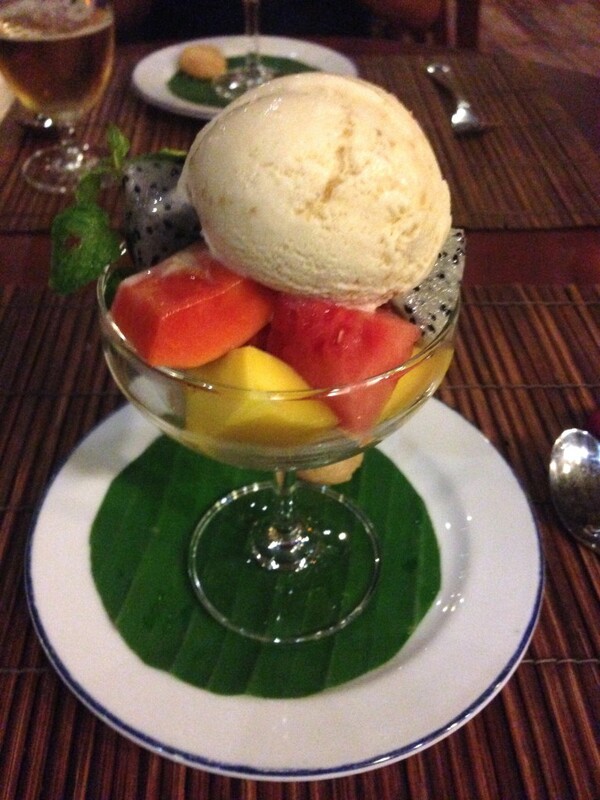 To finish we had a really tasty tamarind and coconut sticky rice and a selection of fresh fruit. The Pun Pa evening was really fun, being a sharing experience where we sat with other diners at a communal table and got our fingers really dirty. The food was really homely and yummy and well worth trying. 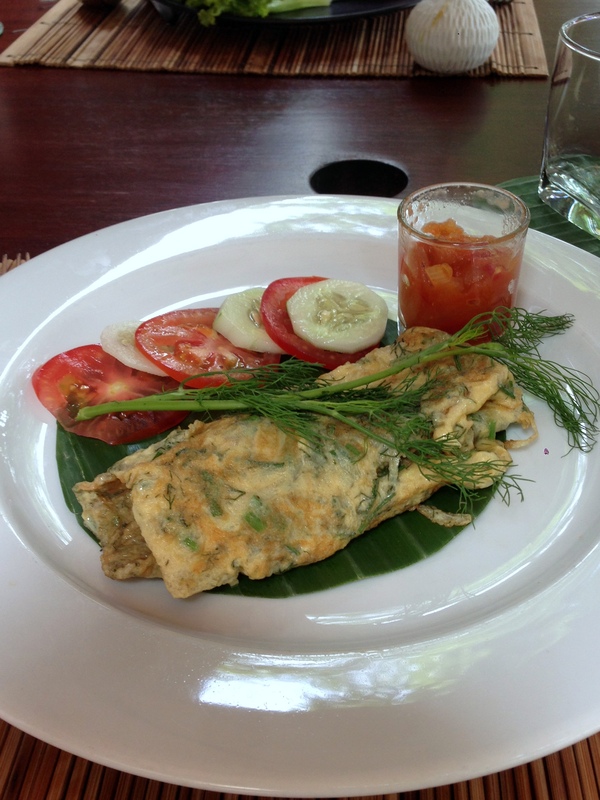 3 Nagas is a boutique hotel in Luang Prabang with a very fine restaurant. We had lunch here and enjoyed a dish of minced pork in banana leaf with fresh herbs (60,000KIP – £4.65) and Laotian omelette (60,000KIP – £3.90) with herbs, Mekong riverweed and tomato sauce. The pork was good, but the omelette was outstanding and delightfully with lots of lovely dill. The tomato sauce was sweet and lovely and worked a treat with the eggs. It was worth going to 3 Nagas just for this dish. Note you can get 20% off voucher from the Tourism Office for use at 3 Nagas. The Morning Food Market is without a doubt one of the highlights of any visit to Luang Prabang. 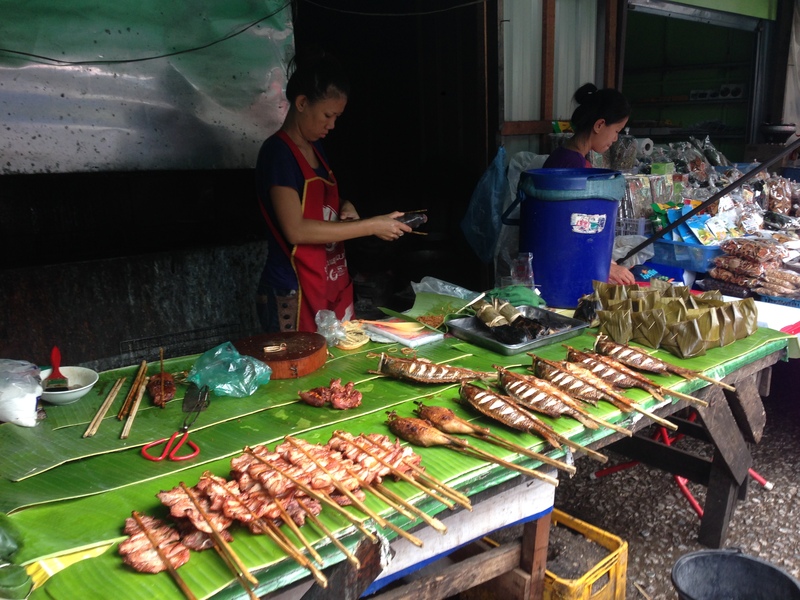 Here you can try some delightful spicy Laotian sausage and some delicious, if somewhat fatty, skewered pork (both 10,000KIP – 80p). I recommend buying the sausages and the pork from the vendor featured in the photo. She cooks the sausages and the pork right in front of your eyes. I walked up and down the length of the market and her products were by far the best. 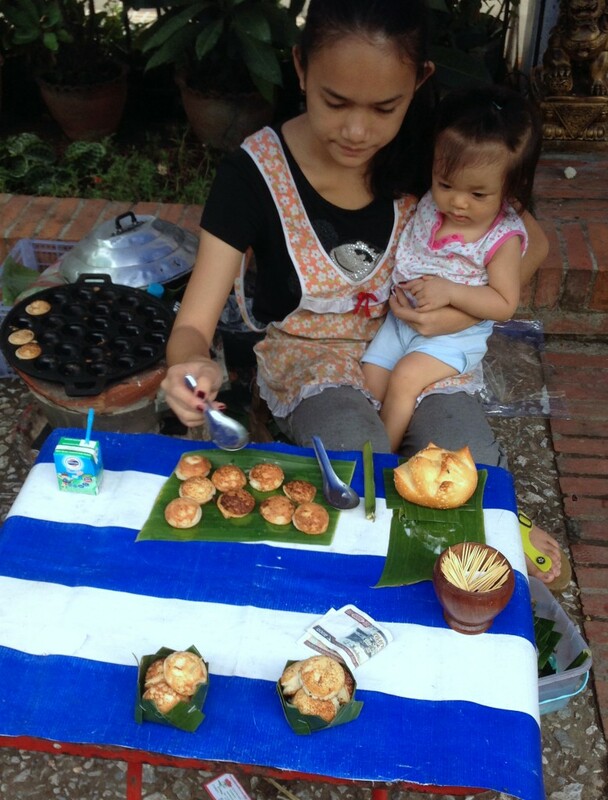 One of my most favourite Laotian treats was the coconut cakes, ‘khao nom kok’ (5,000KIP – 40p). These were a delight with a crunchy outside and soft creamy inside and very addictive. I tried these from a number of different vendors and liked the ones sold by the lady featured in this photo the best. If you go at the right time of the day to the morning food markets she’ll make these hot for you. And if you buy from her regularly she’ll probably give you extras like she did for me! 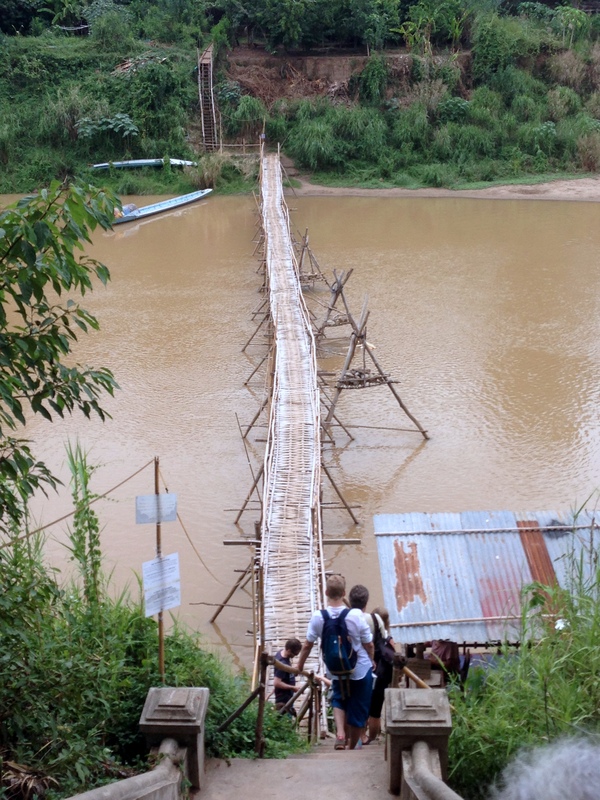 One of the tourist highlights in Luang Prabang is the Bamboo Bridge which sits over the Nam Khan River. This bridge only exists for six months of the year. During rainy season the bridge has to be taken down as the water levels are too high and the current is too strong. The bridge is then rebuilt after the rainy season. What a quirky labour of love! It’s worth crossing the bridge for the views, and on the other side of the bridge there is a cool little hangout spot, the Dyen Sabai Restaurant. Set in a bamboo garden and surrounded by greenery, it was a great place to chill out and enjoy some cocktails. Belmond La Résidence Phou Vao is a beautiful luxury resort and spa located in Luang Prabang, Laos, a UNESCO World Heritage Site. The resort is located on Phou Vao hill, about two kilometres from the centre of Luang Prabang, and is set within three hectares of lush gardens and greenery. Its hill top location means that guests are afforded with views of the surrounding hills and Mount Phou Si, Luang Prabang’s sacred hill upon where there is a Buddhist Temple. Belmond La Résidence Phou Vao combines a French colonial style with Laotian touches to create the ultimate sense of classical luxury and comfort. It’s a gorgeous part of the world and incredibly intimate and tranquil, making for a very romantic setting for dinner. Phou Savanh is the restaurant at Belmond La Résidence Phou Vao and is wonderfully comfortably and spacious. It has high ceilings and open doorways that give it an airy feel. Executive Chef Walter Andreini hails from Brussels but also spent 14 years running his own restaurant in Koh Samui. 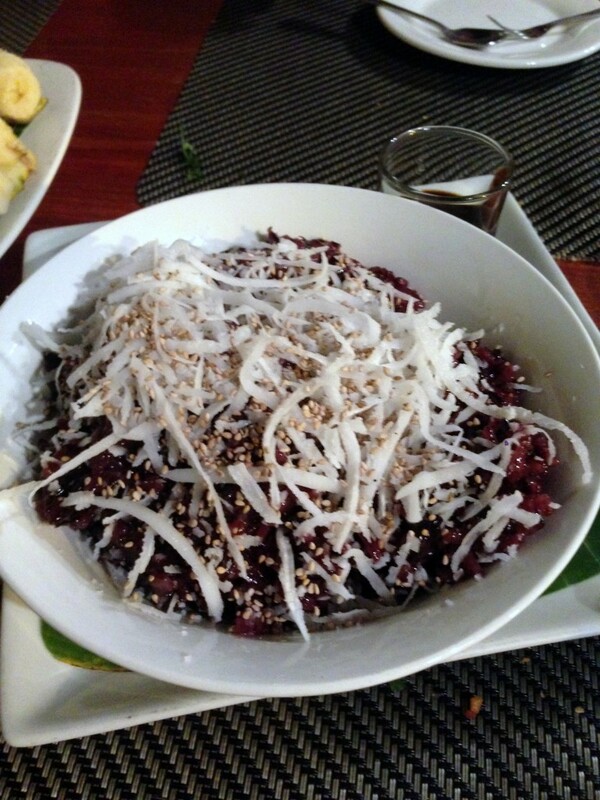 Consequently, the restaurant is a blend of east meets west, with both an Asian and a more classical French menu. The Asian menu itself is a fusion of inspirations, drawing on dishes from Laos, Thailand and Vietnam, all cooked with a European touch. There is both indoor and outdoor seating at Phou Savanh, and adjacent to the restaurant is the Belmond La Résidence Phou Vao’s Champa Bar. Both the restaurant and the bar look out onto the resort’s infinity pool, which in turn merges with a view of Luang Prabang’s beautiful green treetops and Mount Phou Si. It made for a spectacular spot to knock back some cocktails which we duly did. We tried the Belmond La Résidence Phou Vao’s signature cocktail of ‘Simply Laos’ which consisted of Lao-Lao (a Laotian rice whisky), hibiscus flower, honey and lime (USD$9.50), and a Laojito (USD$9.50) with Lao-Lao, lemongrass, mint, lime and sugar over crushed ice. 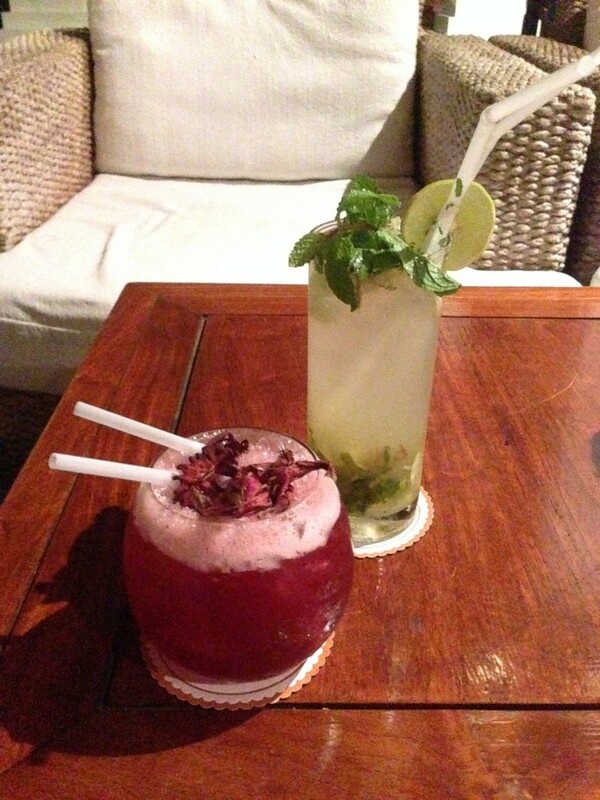 Both were really delicious and refreshing.